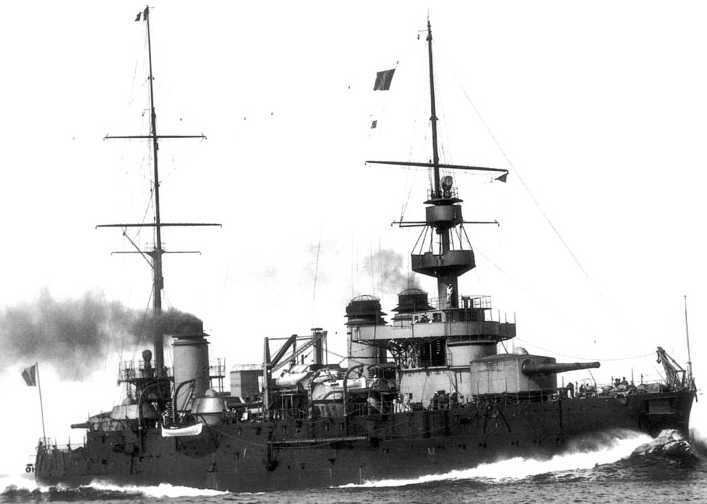 Pre-dreadnought Liberté. The 194 mm/50 (7.64") guns are in both the amidships turrets and in casemates. A medium caliber gun used on the last of France's pre-dreadnoughts and armored cruisers. Some weapons were reused as coastal artillery after these ships were scrapped after World War I. Model 1891 differed from the Model 1887 in having a long breech block. Unless otherwise stated, the data that follows is for the Model 1902. ^"Armored Cruiser Dupuy de Lôme" states that the Model 1887 gun fired 165 lbs. (75 kg) rounds when originally introduced. A heavier round was adopted in the late 1890s. "Naval Weapons of World War Two" states that heavier projectiles and higher muzzle velocities were in use during the 1940s. Cruiser Gloire in January 1904. Ministère de la Défense Photograph. Armored Cruiser Chanzy. Ministère de la Défense Photograph. Bow 194 mm/50 mounting on Armored Cruiser Amiral Aube. Bain News Service Photograph. Library of Congress Photograph ID LC-DIG-ggbain-03070. 194 mm/50 (7.64") stern mounting on Armored Cruiser Amiral Aube. Bain News Service Photograph. Library of Congress Photograph ID LC-DIG-ggbain-24308.